Go West! 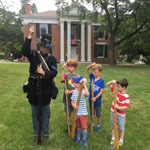 Field Day is a unique field trip experience that incorporates skilled reenactors, historic experts and carefully crafted hands-on activities to immerse students in the historic frontier while at the home of the famed frontier freighter Alexander Majors.Students at Go West! Field Day will have both hands-on and listening experiences. Classrooms will rotate through several different stations – each with a unique story to tell about the American frontier. 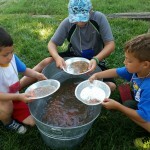 Students will hear from a wagon master that lived at the Majors House, meet teamsters, tour the Majors House, decide how to load their wagon, and pan for gold.